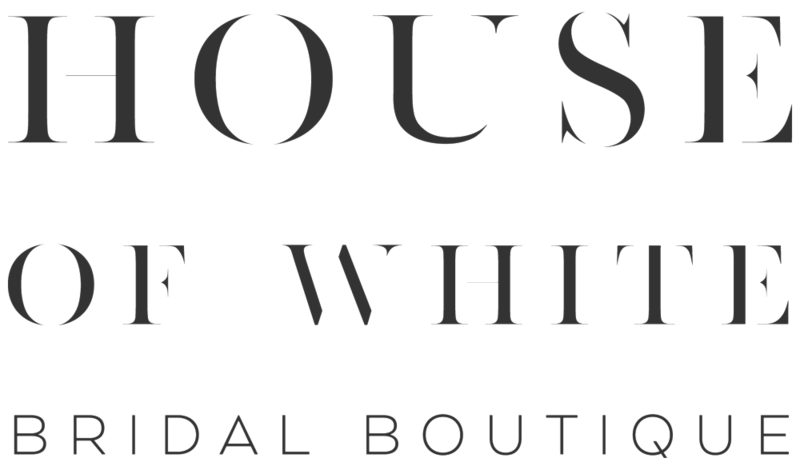 House of White was created in 2012 by husband and wife team Chris Lunn and Andrea Whitehead. Together they had a vision for a picturesque boutique in the heart of a charming shopping district in Southern Indiana. They purchased a historic building in Historic Newburgh (a white house, of course), and lovingly renovated it into a lush-yet-comfortable bridal destination. With the perfect setting complete, brides immediately responded to Andrea's technique of fashion consulting and full-service styling. With a background in fashion design and by beginning her career in the couture bridal industry, Andrea focuses on presenting brides with quality, beautifully constructed modern designs that perfectly suit each bride’s unique style and wedding day vision. What is your current favorite bridal trend? I love that ballgowns are back! I was a ballgown bride myself, and there's something so fun and fabulous about twirling around in all that fabric. How would you describe your personal style? Jenna Lyons meets Jackie Kennedy. What's your best piece of advice for brides as they shop for their wedding gown? Finding your wedding gown is a decision driven by emotion rather than practicality. Go into it with an open mind and heart. Do a little bit of research and preparation so that when you slip into THE dress, you can shout 'YES!' without any hesitation. It's a moment you'll never forget. If you could have lunch with anyone, who would it be and what would you order? Tina Fey. And we would have donuts for lunch. What's your signature cocktail? Mojitos in summertime. Vodka martinis in the wintertime. But let's face it, I'm a new mom. I'm pretty sure half a martini would put me on the floor. What's your favorite part about styling brides? I love helping women see themselves in a new light; introducing them to a style that makes them look and feel more incredible than they ever imagined. Sometimes we can get in our own way and we think we know exactly what we want. But it's nice when a bride trusts me to lead her outside her comfort zone...and the result is just magic. What's your current favorite bridal trend? I'm happy to see couples putting more consideration into the groom's attire. A well made, dark suit will never disappoint. Guys, you know how much time and consideration goes into your bride's wedding day look. Use this opportunity to get yourself a well fitting suit you'll wear for years. How would you describe your personal style? My personal style is a characterized by extremes. I'm either wearing a tailored blue suit, or I'm renovating our house wearing jeans and t-shirts covered in paint and plaster. There is no in-between. What's your best piece of advice for brides as they shop for their wedding gown? Look at yourself in the mirror. I often see brides come out in a gown and don't even look at themselves; they turn to their group and await their critiques. Your group is there to support you, not critique you. The decision has to be yours. If you could have lunch with anyone, who would it be and what would you order? Jerry Seinfeld would pick me up in a car that is the embodiment of my personality, and we'd go to a greasy New York diner for bacon and eggs...and coffee, of course! What's your signature cocktail? Either a very old scotch, or a very cold PBR. Like I said, I'm characterized by extremes. What's your favorite part of working with brides? I never get tired of hearing people's awestruck reaction when they walk into our store. So much of my sweat goes into making this place beautiful, and hearing the thrill our clients feel when walking through our doors makes it all worth it. What is your current favorite bridal trend? I love how designers are using three-dimensional appliqué and bead work on gowns. Flowers and different designs that actually pop off the gown are so fabulous and unique! How would you describe your personal style? My style is very girly. Whether I am wearing pops of color or all black, there is always a girly aspect to the outfit. I love dressing up and you will rarely catch me wearing shoes that don't have some sort of a heel on them! What's your best advice for brides shopping for their wedding gown? Stay true to yourself, but don't be afraid to step outside of your comfort zone. You want to look like yourself on your wedding day, just a fancier version! So don't be afraid to try on that wildcard gown! If you could have lunch with anyone, who would it be and what would you order? Blake Lively. We would have dessert for lunch and hopefully she would allow us to take it back to her house (her closet specifically) and I'd get to play dress up! What's your signature cocktail? Really anything with champagne in it! But I am especially a sucker for mimosas. I am a firm believer that these are not a "brunch-only" drink. I will drink one any time of the day or night! What's your favorite part about styling brides? I absolutely love getting to know my brides. Typically I've never met my brides until they walk into House of White for their appointment, but by the end of the appointment it’s like we've known each other for years! Having the chance to get to know them and earn their trust during their appointment is so special to me. If I run into one of my brides outside of House of White, chances are we will run up to each other and hug and chat! I love that so much! What is your current favorite bridal trend? My favorite bridal trend right now is anything detachable! I am obsessed with a detachable train, cape, or over-skirt. I love the idea of having a "two-in-one" dress to keep things unique for the ceremony and reception. How would you describe your personal style? I would describe my style as chic and modern, also slightly trend driven! I love to find inspiration through fashion bloggers. What's your best advice for brides shopping for their wedding gown? My best advice to brides is to be confident in what you love on yourself! If you find a dress that you absolutely love but your group has different opinions about it, that's okay! This is YOUR wedding dress. Everyone will see how stunning you are on your big day in the gown you chose for yourself, and no one will question your decision. Own it! If you could have lunch with anyone, who would it be and what would you order? I would have lunch with Taylor Swift, and we would talk about cats over coffee at a cafe in Nashville! What's your signature cocktail? I love a good sangria any time of year. But my signature cocktail would have to be a cosmopolitan - just call me Carrie Bradshaw! What's your favorite part about styling brides? My favorite part of styling a bride is seeing the moment she realizes she has found her wedding gown. It is a special moment for her, and the whole room is always in awe of the bride in this moment. It is such a fulfilling emotion for me, and I am honored to help brides find their wedding gown.